Author Davis Bunn did it again. He drew me into a story I knew nothing of. The story crept up on me and, before I knew it, I was hooked. It’s no secret I’m a big Davis Bunn fan. I think I’ve read all of his books. Some of my favorites were his historical fiction, so I’m not a hard reader to hook in that genre. 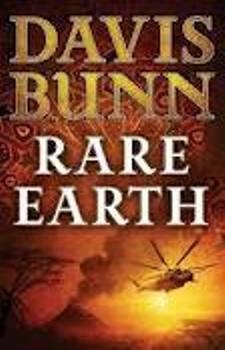 Rare Earth, however, is set in contemporary times. Although it is Book 2 in the Marc Royce series, it's a stand-alone novel that can be read with no knowledge of Book 1. Bunn’s main character, Marc Royce, seems to me a real man’s man. He’s the strong, silent type who always gets the job done. He’s introspective, though, and compassionate; he proves the adage that still waters run deep. He’s together in so many ways, but he’s running, too. All of this makes him a very complex, interesting character. The settings of Rare Earth are not familiar to me, and I love it when I learn something from fiction. (A given with Davis Bunn’s books.) I was compelled to learn more about believers in Kenya and driven to understand the mystery that is Marc Royce. The stakes were high in this book in several ways; I cared about the characters and the situations. So I couldn’t stop reading. And when it was over? I was sorry I’d reached the end…and am looking forward to Book 3. Here’s a little more about the author and book, from Davis Bunn himself. What can readers expect to find in Rare Earth? All my books hold to one key aim—to create a story that carries a moral, and together result in an impact or challenge or inspiration or comforting assurance that remains long after the book is set down. That, to me, defines a worthy effort. What kind of character is Marc Royce? He carries his faith into a world that likes to think Jesus no longer plays a role. He sees himself as the ultimate outsider, wounded by the loss of his wife, searching for a place he can call home, and an ideal worth living for—or giving his life for. Tell us about one or two other key characters. Like the book that launched this series, Rare Earth is a story about the missionary church. Many of the other characters are Kenyan, and reveal the amazing role that believers play in this nation. What type of research did you do for this series? I worked in Africa for four years early in my adult life. I was not a believer at that time. I came to faith four years later. I taught in Kenya last year, the first time I had been back to sub-Sahara Africa in almost twenty years. Going back to Africa now, as a believer, has opened my eyes to many things. Seeing with the compassion of sharing faith and seeking to serve means that I do not merely observe, I share with them. I hope this comes across in my story. Research is a huge component of all of my stories. But with Lion of Babylon and Rare Earth, the situation was quite different. In both these Royce novels, I was combining knowledge gained in my previous business life with the perspective gained from my walk in faith. It has been quite a fulfilling experience, personally, to revisit these lands and see them through the eyes of our compassionate God. I received a complimentary copy of this book for review from Bethany House Publishers. I was not required to write a positive review. The opinions I have expressed are my own. I am disclosing this in accordance with the Federal Trade Commission's 16 CFR, Part 255. Looks interesting! I usually don't buy books for my tablet, but I may see if the local library has his books. Thanks! Oh, I'll have to look for this. I loved Lion of Babylon. Why are you adding to my teetering books-to-read pile?! It's already so high.